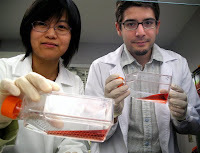 Scientists shed light on inner workings of human embryonic stem cells Thursday, 30 April 2009 Scientists at UC Santa Barbara have made a significant discovery in understanding the way human embryonic stem cells function. They explain nature's way of controlling whether these cells will renew, or will transform to become part of an ear, a liver, or any other part of the human body. The study is reported in the May 1 issue of the journal Cell. The scientists say the finding bodes well for cancer research, since tumour stem cells are the engines responsible for the growth of tumours. The discovery is also expected to help with other diseases and injuries. The study describes nature's negative feedback loop in cell biology. "We have found an element in the cell that controls 'pluripotency,' that is the ability of the human embryonic stem cell to differentiate or become almost any cell in the body," said senior author Kenneth S. Kosik, professor in the Department of Molecular, Cellular & Developmental Biology. Kosik is also co-director and Harriman Chair in Neuroscience Research of UCSB's Neuroscience Research Institute. "The beauty and elegance of stem cells is that they have these dual properties," said Kosik. "On the one hand, they can proliferate –– they can divide and renew. On the other hand, they can also transform themselves into any tissue in the body, any type of cell in the body." The research team includes James Thomson, who provided an important proof to the research effort. Thomson, an adjunct professor at UCSB, is considered the "father of human embryonic stem cell biology." 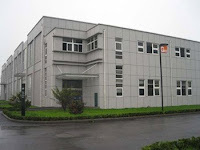 Thomson pioneered work in the isolation and culture of non-human primate and human embryonic stem cells. These cells provide researchers with unprecedented access to the cellular components of the human body, with applications in basic research, drug discovery, and transplantation medicine. With regard to human embryonic stem cells, Kosik explained that for some time he and his team have been studying a set of control genes called microRNAs. "To really understand microRNAs, the first step is to remember the central dogma of biology –– DNA is the template for RNA and RNA is translated to protein. But microRNAs stop at the RNA step and never go on to make a protein.” "The heart of the matter is that before this paper, we knew if you want to maintain a pluripotent state and allow self-renewal of embryonic stem cells, you have to sustain levels of transcription factors, including Oct4, Sox2 and Klf4," said Kosik. "We also knew that stem cells transition to a differentiated state when you decrease those factors. Now we know how that happens a little better." Transcription factors are genes that control other genes. On the other hand, microRNAs are single-stranded RNA molecules that control the activity of other genes. When microRNAs in the genome are transcribed from DNA, they target complementary messenger RNAs (mRNAs), which serve as the templates for proteins, to either encourage their degradation or prevent their translation into functional proteins. In general, one gene can be repressed by multiple microRNAs and one microRNA can repress multiple genes, the researchers explained. In a wide variety of developmental processes, microRNAs fine tune or restrict cellular identities by targeting important transcription factors or key pathways. 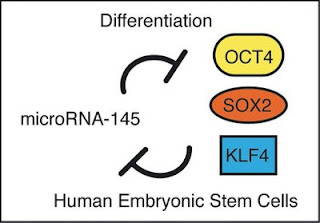 Kosik's team found that levels of miR-145 change dramatically when human embryonic stem cells differentiate into other cell types. miR-145 was of particular interest because it had been predicted to target Oct4, Klf4 and Sox2. The new research shows that a microRNA –– a single-stranded RNA whose function is to decrease gene expression –– lowers the activity of three key ingredients, Oct4, Sox2 and Klf4, in the recipe for embryonic stem cells. The discovery may have implications for improving the efficiency of methods designed to reprogram differentiated cells into embryonic stem cell-like cells. As few as three or four genes can make cells pluripotent. Those three factors are perhaps best known as three of four ingredients originally shown to transform adult human skin cells into "induced pluripotent stem cells" (iPS cells), which behave in nearly every respect like true embryonic stem cells. That four-ingredient recipe has since been pared down to one, Oct4, in the case of neural stem cells. "We know what these genes are," Kosik said. That information was used recently for one of the most astounding breakthroughs of biology of the last couple of years –– the discovery of induced pluripotent skin cells. "You can take a cell, a skin cell, or possibly any cell of the body, and revert it back to a stem cell," Kosik said. "The way it's done, is that you take the transcription factors that are required for the pluripotent state, and you get them to express themselves in the skin cells; that's how you can restore the embryonic stem cell state. You clone a gene, you put it into what's called a vector, which means you put it into a little bit of housing that allows those genes to get into a cell, then you shoot them into a stem cell. Next, when those genes –– those very critical pluripotent cell genes –– get turned on, the skin cell starts to change; it goes back to the embryonic pluripotent stem cell state." The researchers explained that a rise in miR-145 prevents human embryonic stem cells' self-renewal and lowers the activity of genes that lend stem cells the capacity to produce other cell types. It also sends the cells on a path toward differentiation. In contrast, when miR-145 is lost, the embryonic stem cells are prevented from differentiating as the concentrations of transcription factors rise. They also show that the control between miR-145 and the "reprogramming factors" goes both ways. The promoter for miR-145 is bound and repressed by a transcription factor known as OCT4, they found. "It's a beautiful double negative feedback loop," Kosik said. "They control each other. That is the essence of this work." Human embryonic stem cells are poised between a proliferative state with the potential to become any cell in the body and a differentiated state with a more limited ability to proliferate. To maintain this delicate balance embryonic stem cells express a set of factors, including OCT4, SOX2, and KLF4, to control multiple genes that sustain the proliferative pluripotent state. A tiny RNA called miR-145 can repress these genes, and in turn, one of the transcription factors, OCT4, can repress miR-145. Thus, a double negative feedback loop sets the delicate balance. Gladstone scientists identify key sequence of transcription factors driving heart cell creation Tuesday, 28 April 2009 Scientists at the Gladstone Institutes of Cardiovascular Disease have identified for the first time key genetic factors that drive the process of generating new heart cells. The discovery, reported in the current issue of the journal Nature, provides important new directions on how stem cells may be used to repair damaged hearts. For decades, scientists were unable to identify a single factor that could turn non-muscle cells into beating heart cells. Using a clever approach, the research team led by Benoit Bruneau, Ph.D., found that a combination of three genes could do the trick. This is the first time any combination of factors has been found to activate cardiac differentiation in mammalian cells or tissues. "The heart has very little regenerative capacity after it has been damaged," said Dr. Bruneau. "With heart disease the leading cause of death in the Western world, this is a significant first step in understanding how we might create new cells to repair a damaged heart." Two of the three genes encode proteins called transcription factors, which are master regulators that bind to DNA and determine which genes get activated or shut off. 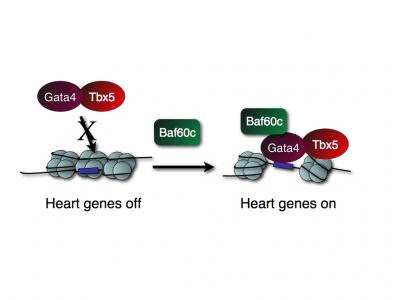 The two transcription factors, GATA4 and TBX5, cause human heart disease when mutated and cooperate with each other to control other genes. 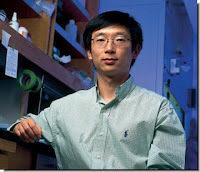 When Dr. Bruneau and postdoctoral fellow Jun K. Takeuchi added different combinations of transcription factors to mouse cells, these two seemed important for pushing cells into heart cells — but they were not enough. "When we finally identified the key factor that could work with GATA4 and TBX5 to turn cells into beating heart cells, it was somewhat of a surprise to us," said Dr. Bruneau. This represents how the cardiogenic factors turn on heart genes. The transcription factors, Tbx5 and Gata4, cannot access the DNA unless Baf60c is present. When all three are introduced, Baf60c helps open up the closed chromatin, and lets Tbx5 and Gata4 work together to turn on the heart genes. Credit: Benoit Bruneau, The Gladstone Institute of Cardiovascular Disease. What makes a cow a cow? Genome sequence sheds light on ruminant evolution Friday, 24 April 2009 Researchers report today in the journal Science that they have sequenced the bovine genome, for the first time revealing the genetic features that distinguish cattle from humans and other mammals. The six-year effort involved an international consortium of researchers and is the first full genome sequence of any ruminant species. Ruminants are distinctive in that they have a four-chambered stomach that – with the aid of a multitude of resident microbes – allows them to digest low quality forage such as grass. The bovine genome consists of at least 22,000 protein-coding genes and is more similar to that of humans than to the genomes of mice or rats, the researchers report. However, the cattle genome appears to have been significantly reorganized since its lineage diverged from those of other mammals, said University of Illinois animal sciences Professor Harris Lewin, whose lab created the high-resolution physical map of the bovine chromosomes that was used to align the sequence. Lewin, who directs the Institute for Genomic Biology, also led two teams of researchers on the sequencing project and is the author of a Perspective article in Science on the bovine genome sequence and an accompanying study by the Bovine Genome and Analysis Consortium. "Among the mammals, cattle have one of the more highly rearranged genomes," Lewin said. "They seem to have more translocations and inversions (of chromosome fragments) than other mammals, such as cats and even pigs, which are closely related to cattle.” "The human is actually a very conserved genome as compared to the ancestral genome of all placental mammals, when you look at its overall organization." The sequence of the cow's 29 pairs of chromosomes and its X chromosome (the Y chromosome was not studied) also provides new insights into bovine evolution and the unique traits that make cattle useful to humans, Lewin said. The first cow genome to be sequenced was that of a Hereford cow named L1 Dominette, shown here with her calf. Credit: Photo courtesy of USDA Agricultural Research Service Research Geneticist Michael D. MacNeil. What's wrong with cloning humans? Emory study yields evidence of processes that erases epigenetic signals Friday, 17 April 2009 An Emory University study shows some of the first direct evidence of a process required for epigenetic reprogramming between generations – a finding that could shed more light on the mechanisms of fertilization, stem-cell formation and cloning. The journal Cell published the results of the study on the nematode C. elegans in its April 17 issue. "We believe that we have demonstrated one of the processes that erases the information in a fertilized egg, so that the offspring can begin life with a clean slate," says David Katz, lead author of the study. Katz is a post-doctoral fellow in the lab of William Kelly, associate professor of biology at Emory and a co-author of the study. "One of the most fundamental mysteries in biology is how a sperm and egg create a new organism. By looking at the process at the molecular level, we're gaining understanding of this basic question of life," Katz says. When a sperm cell fertilizes an egg cell, the specialized programming of each parent cell must be erased, in order to form a zygote that can give rise to a new organism. The process by which these two differentiated cells return to a developmental ground state in the zygote – the ultimate stem cell – is little understood. 'An amazing phenotype' The Emory researchers wanted to test the theory that removal of a particular histone protein modification involved in the packaging of DNA – dimethylation of histone H3 on lysine 4 – is involved in reprogramming the germ line. 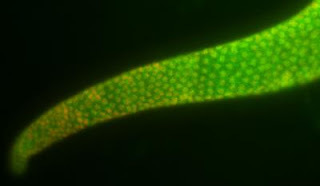 They compared successive generations of a normal strain of C. elegans – a microscopic worm commonly used for studying cell differentiation – with a mutant strain. The mutants lacked an enzyme (KDM1) that test-tube experiments have previously shown appears to play an "erasing" role – demethylating histones to remove information from the packaging of DNA. This is KDM1 enzyme localisation in a dissected worm, C. elegans, gonad. Credit: David Katz.